NAVTEX (NAVigational TEleX) is an internationally accepted, automated, medium and high frequency, radio telex broadcast (also known as Narrow Band Direct Printing or NBDP) system. The purpose of NAVTEX is to broadcast localized Marine Weather forecasts and warnings as well as urgent and routine Maritime Safety Information (MSI) on a common frequency using the English language. Provisions for (2) other frequencies, used for national or special broadcasts, most often in the host nation’s language dependent on where the transmitter is located. The NAVTEX system was developed to offer a low-cost, simple, and automated means of receiving this information aboard vessels at sea from the sea buoy out to 200 to 300 and often as much as 400 nautical miles offshore using a low-cost dedicated receiver and no user fees to use the system. The inauspicious beginnings of NAVTEX was started by our cousins on the other side of the pond. During the 1970's, the Post Office Coastal Radio Station in Cullercoats, United Kingdom began broadcasting weather forecasts and warnings for the North Sea and the English Channel using radio teletype. The favorable response was such that by 1983 this system became operational and the service extended to include the western sea areas. In 1985 the U.K. sea areas to the east became part of the system. By 1987 NAVTEX was being adopted by other countries around the world and Marine Safety Information was included in the broadcasts and the frequency 518.0 kHz was formalized. The NAVTEX system was incorporated into the regulations for the Global Maritime Distress and Safety System (GMDSS) and introduced with a phase in period from 1992 to 1999. For simplicity sake, there are only (2) types of NAVTEX receivers - SOLAS (Safety of Life at Sea) and Non-SOLAS. The differences between the two while not great on paper, are pretty significant on the wallet. The primary difference between the two is: A SOLAS vessel, by regulation, must keep a watch on the "International Broadcast" frequency 24/7 when underway with no exceptions. If they wish to also receive NAVTEX data over the "National Broadcast" frequency, it can only be done simultaneously. Many of the newer SOLAS units can actually provide simultaneous reception on a 3rd frequency as well. Non-SOLAS vessels are not required to have this simultaneous frequency reception as they may switch between the frequencies at their discretion. The benefit here is the reduced cost of the NAVTEX unit. Since our focus is primarily on non-SOLAS vessels and recreational boaters and not VLCC Tankers; we are going to concentrate on non-SOLAS NAVTEX systems. Keep in mind though that with the continued advancements in electronics; crossovers of capabilities can and often do, exist. The NAVTEX receiver is basically a programmable pre-tuned MF/HF-SSB radio most often incorporating signal processing software. They are typically small, being about the size of a marine VHF radio and use very little power, usually around 250 milliamps. The low electrical draw of these units is another benefit as there is little likelihood of depleting your house batteries if left on overnight. In their simplest form, the NAVTEX receiver directs its encoded data output to a PC device. The PC then decodes the signal and can display it on the PC screen or send it to a printer for a hard copy. The lower level of standalone NAVTEX Receivers have built-in decoders and a display unit where the NAVTEX data is read directly on the built-in screen. In addition most have the ability to send the decoded data output to either a PC or directly connected printer. The top of the line NAVTEX Receivers typically incorporate both a display unit and a built-in printer for hard copies. All stand-alone NAVTEX Receivers come with ample storage memory in order to save large numbers of previous messages for review when and if required. What Frequencies Should I Guard? (3) Frequencies have been assigned to the NAVTEX System and these frequencies do not change. The primary "International Broadcast" frequency is 518.0 kHz. NAVTEX broadcasts on this frequency are in the English language worldwide. The "National Broadcast" frequency is 490.0 kHz. Broadcasts on this frequency are typically in the host nation states language in which the NAVTEX transmitter is located. A third frequency 4209.5 kHz has been set aside as a special purpose frequency for use in the world's tropical areas and is rarely used at this time. In countries where English is spoken exclusively, like the U.S. or the U.K., there is little or no need for use of the "National Broadcast" frequencies. However, in non-English-speaking countries the "National Broadcasts" on 490.0 kHz are vital part of the system for the citizens of that country. In some cases, a country may have (2) official languages, Canada being a perfect example. In this case the English-speaking citizens of Canada would rely on the "International Broadcast" frequency of 518.0 kHz while the "National Broadcast" frequency of 490.0 kHz would be done in French. What Stations Should I Guard? NavArea I (United Kingdom) encompassing a portion of the North Atlantic Ocean, The North Sea, and the Baltic Sea. NavArea III (Spain) would encompass the entire Mediterranean, Black, and Caspian Seas. 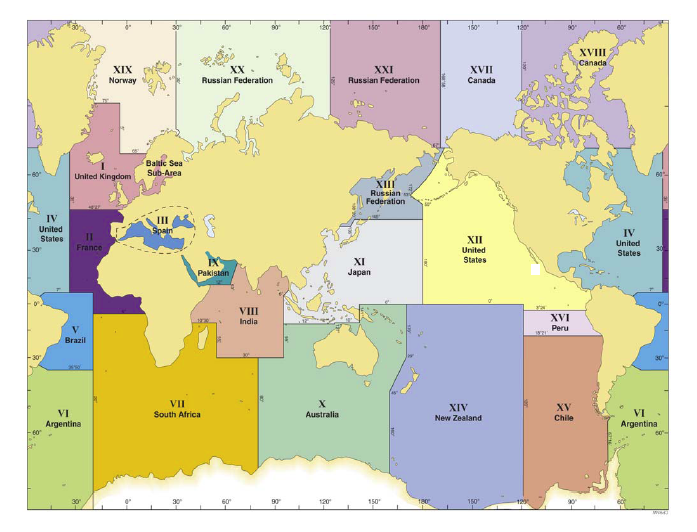 You can view the chart below to see all of the NavAreas and their boundaries. Walvis Bay - Designated "B"
Cape Town - Designated "C"
Port Elizabeth - Designated "I"
When looking at NavArea VIII (India,) they also have a NAVTEX Station designated by the letter "C" among others. There is no conflict between these stations as they are separated by enough distance to prevent one station overriding the other. The best answer to "Which station should I guard?" is obviously the station closest to you within the NavArea that you are currently in and if you are in transit, then those stations that are along your route of travel. This is (almost) done for you automatically. Since the NAVTEX System was designed to use relatively low transmitter power, typically, the only stations you will hear are those in the area that you are transiting. In areas where there are (2) closely located NAVTEX transmitter sites or you are lucky enough to have a unit with better than average receiver sensitivity, interfacing your NAVTEX unit with your GPS really makes life simple. With the GPS unit feeding your location to the NAVTEX receiver, many NAVTEX receivers will automatically select the nearest station to your location and filter out broadcasts from other stations. This allows you to receive up to date weather and safety information for the area you are in; pretty much with no intervention on your part. What Type of Information is Received? Search & Rescue Information, piracy warnings, tsunami warnings, etc. Another great feature of the NAVTEX System, is that with few exceptions, you can filter out much of this information. If you are cruising the Caribbean, you have little need for "Ice Reports." Likewise, for most boaters, safety information messages concerning LORAN outages are likely not needed when most everyone is making use of GPS. This means that you can tailor the types of information that you receive based on cruising areas, your own vessel’s equipment requirements, your vessel's size, or simply your personal preferences. With the NAVTEX system being dedicated to marine usage, mariners in the U.S. will probably appreciate the fact that they will not have to listen to the NOAA daily crop reports or how many heating and cooling degree days there are before getting to the information that you really need; like the significant wave heights. Since it is provided in a text format and you can send it to a printer or read it directly from the screen, there is no second guessing of "was that 2 to 4 feet or 4 to 6 feet?" A caveat to the built in printers. These are typically of the thermal printer design with poor print quality. I personally have the output of the receiver also sent to my PC where I can print the transmission on a higher quality printer that is more easily read and the print doesn’t disappear when exposed to sunlight or high temperatures. Most sets are designed to sound an alarm when it receives messages warning of a problem with aids to navigation, severe weather or search and rescue activities. Mariners who do a lot of cruising should carefully consider adding a NAVTEX receiver to the electronics suite aboard their vessels if their budget allows. A PC based Navtex Receiver.